Today I met my blogging friend Anne for the first time. Take a look at her interesting blog, which is mainly about France; she has some stunning photos. It is amazing that after following each other's blogs for several months, we discovered that our homes in the UK are in the same village. We are just walking distance from each other!! Over a cup, or 2, of coffee we chatted away for ages. It was so good to be able to just talk and find out more about each other. We will meet again. While out shopping the other day, I saw squid marked down to half price, I always love a bargain so I thought I would give it a try. Squid with Lemon and Garlic. Pull out the little tentacles and wash, dry with kitchen paper and put aside for later. Cut the body section into 1 cm (½ inch) rings and wash them under cold running water; pat dry with kitchen paper. 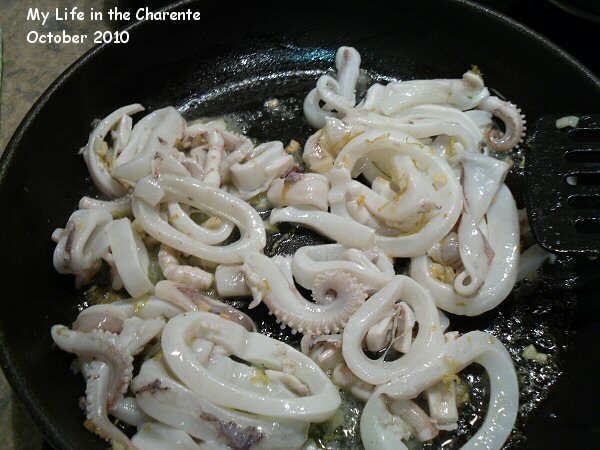 Place them in a small dish, adding the reserved tentacles. 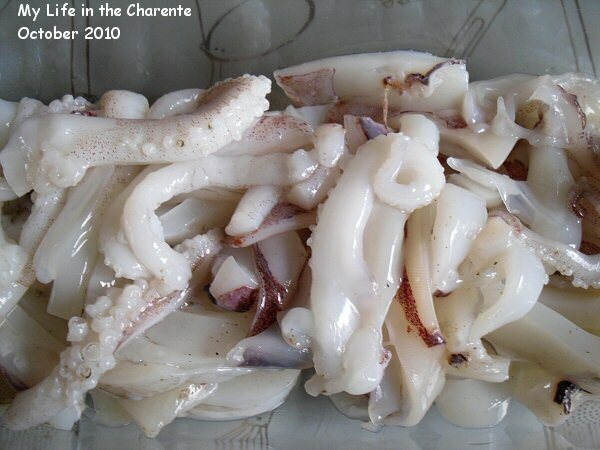 Squeeze the lemon juice over the squid pieces, toss and leave it for 10 minutes. Drain the squid through a colander and shake well to remove excess liquid. Heat oil in a large, non stick frying pan, add the garlic and lemon zest while cool, allowing the oil to get hot. When it is hot, add the squid and fry it, stirring it all the time so it just slightly takes on a little colour at the edges – it cooks very quickly, a maximum of 2 minutes. Then add the salt, pepper and parsley and serve it straight away from the pan, with lemon wedges to squeeze over. 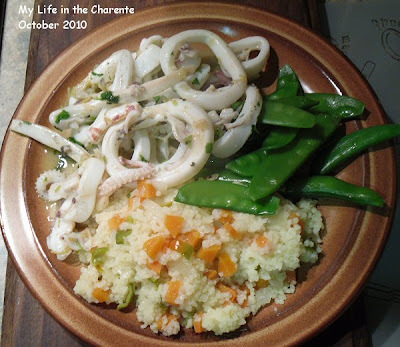 I served it with couscous and mange tout and I was very sorry that I had not bought more squid and frozen them!! When cooking couscous I chop up a few vegetables that I might have in the fridge. This time I used 1 carrot, 1 onion, a clove of garlic and a small pepper. After chopping them quite small, I add a little oil to the saucepan and cook the vegetables gently. When the vegetables are soft, I add 400 ml (14 fl ozs) of water, with a teaspoon of chicken stock powder, and bring it to the boil. I then add 200gr (7 oz) of couscous, stir well, put the lid on the pan and allow it to stand for 5 to 10 minutes. Mix well with a fork and serve. Diane, what a thrill for you to meet a fellow blogger...and one who lives so close. I am going over to Anne's site right now!! By the way, the squid look wonderful. I would so enjoy eating them..unfortunately it does not go over big in the US. Can't find it much at all. What a coincidence, finding that the author of a blog you read lives so close by! How nice to meet a cyber-friend! That red color is very flattering on you; you should own a bunch in that color! Oh I wish I could meet up with a fellow blogger as well, and keep hoping that someone will fetch up close to visit me eventually. But that squid! Sorry, but I don't 'do' squid, but hope you enjoyed it. I have been lucky to meet up with some of my blogging buddies too. How nice it is to meet them. What a coincidence that Anne stays so close. Oh how fun to meet a fellow blogger. Recipe sounds good. Squid isn't something I see around here much, sale or otherwise. 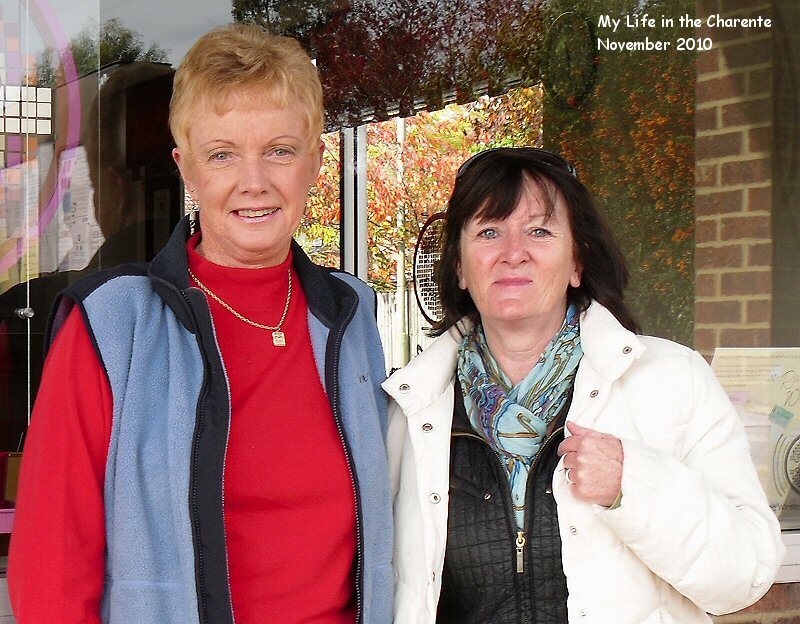 I think it is such fun that you and Anne, got to meet up, it certainly is a small world. The squid sounds absolutely yummy, something we enjoy here, not sure if you saw the photo I posted on BW towards the end of last month. Yes so much fun to find someone who actually came from my village but also from France :-) and all connected through blogging. Small world!! Just like my friends in Paris,we all met through blogging too. It was fab to meet up with Diane, we had a wonderful few hours, and hope to meet up again very soon. Take care Diane see you soon hopefully once all is sorted out with the family..
Diane, how exciting, it sounds like such fun! I was able to meet up with a few fellow blogger this past summer. It is alway so nice to meet someone in person. I saw some nice squid at the market last week, I wish I would of bought some now! I finally cleared up my lable list, thanks to you! I did the archive one right away when you said it took seconds! Thanks for all your help! Hi Lindy, yes it was good to meet up with Anne, very strange we are only walking distance away from each other!! I had not seen your picture, but just had a quick look. I am struggling to keep up with BW, there are so many photos and for that matter I have little time for anything much at the moment. Lyndsey it was really fun to meet up with Anne. I hope I get to meet some more bloggers in due course. I have never eaten squid! I'm sure I would try it but highly doubt I would buy it and make it. I'll have to come over for dinner! I agree; it is really lovely to meet a pen friend! Great recipe! i love squid! We picked and cooked some wild mushrooms yesterday and ate them with a couple of friends! Lots of fun!! Noushka you are braver than me! I do not know which wild mushrooms are edible and which are not!!! How fun to meet up with a fellow blogger! I'm glad you ladies had a good time! The squid dish looks delicious -- really bright and full of flavor! It is always wonderful to meet a fellow blogger. Blogging has such a wonderful way of bringing people together. Awesome!!! WOW!! That's SOOOO BRILLIANT that you two got to meet and that you live so close by to one another.. I remember when Anne first told me-- mind blowing! Well, I think it's lovely-- Maybe you two can take trips to Oxford and London together! How fun! I'll stay tuned and in the meantime-- SOoo glad to hear you met! diane...how much fun to meet a fellow blogger. i haven't meet anyone in person yet...but am looking forward to the day i do. Kary, thanks for the visit. It was great fun meeting Anne and I am sure we will keep in touch nad remain friends. Hope the health problems will be resolved. How wonderful to meet a blogger friend - to turn an online friend into a 'real life' one too. I am visiting your blog for the first time... I benefitted to a large extend... My best wishes..! Oh my I love squid. Meeting a blogger is always a delight! lostpastremembered it was really fun meeting up with Anne and we will certainly keep in touch. Mya yes you are right, Anne does understand my longing for France. It will be great if she comes and visits me there as well. Re the health issues, sadly Nigel's aunt passed away quite suddenly yesterday so he has lots to sort out as she was a spinster. Indie.Tea it was such fun meeting up with Anne, and what a surprise to find we live so close! chubskulit I had forgotten how much I liked squid until I bought this one. It was yummy. That's awesome meeting up with a friend for the very first time! The lemon garlic squid looks good! I'll try that soon! Lani we had the same recipe again last night it was just as good!